After being involved in a severe car accident which left him needing months of rehabilitation, he found chiropractic. The whole experience empowered him to take control of his health and recovery. It was at that moment that I knew I needed to share this with other people. Giving patients the courage, knowledge, and guidance to have a better quality of life has been my greatest purpose. He attended college at The University of Houston and majored in Human Physiology with a minor in Human Nutrition. During his time at the university he worked all 4 years as a research assistant for both the Center for Neuromuscular and Biomechanics Research Institute and for the Texas Obesity Research Center. After completing his undergraduate program, he continued his education at Palmer College of Chiropractic in Port Orange, FL. 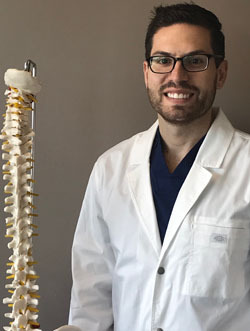 He has added to his education by taking advanced courses in the cervical spine which has allowed him to have a more specific and detailed approach to treating patients with neck and upper back injuries. Additionally, Dr. Antonetti pursued coursework in Activator instrument adjusting in order to be better equipped for patients who enjoy both manual and instrument assisted chiropractic care. Since moving to Miami, Dr. Antonetti enjoys spending time with his fiance, reading, or running near the beach.